Thirsty Pilgrim: Not to Be Taken Too Seriously: USA's Top Microbrew Cities. Not to Be Taken Too Seriously: USA's Top Microbrew Cities. I've said that I won't blog about blogging. However I'm not above the time-honored blogger-hack tradition of picking apart dubious lists. That's what the lists are there for, after all. So we can thank Travel and Leisure magazine for providing this one on the best American cities for microbrewed beer, and Houston-based Examiner writer Bryan Carey for noticing it. Anyway, it's beer and it's travel and that's what we do here at Thirsty Pilgrim Enterprises. First, take a breath: There are only 35 cities up for contention, and they're the same 35 cities for every list. So Kansas City is there, and San Juan, Puerto Rico, but St. Louis is not. And a city in the Top 20 only had to beat out 15 others. The odds are that your city was not even up for consideration. OK, ready? The top city is no surprise: Portland, Oregon. 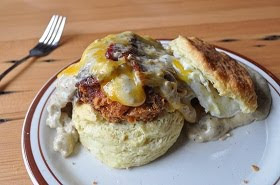 I don't see a category for best breakfast, but surely the deadly combo of Pine State Biscuits (pictured) and Voodoo Donuts would've put Portland over the top there as well. And Denver takes second place, so already this list appears more logical than most. New York City and Washington, D.C., are totally absent, which means they got beat by places like Nashville, Phoenix and Houston. Which is fairly silly, because I think both are among the world's great places to drink craft beer. But there are two groups who vote on these lists: residents and visitors. Not experts. The upshot is that most people who live in or visit those cities don't really know about their craft beer scenes. Or, another possibility: the phrase "microbrewed beer" implies the existence of actual breweries--not a strength of either D.C. or NYC. Who's missing? And if we compiled a world list, who besides Portland and Denver make the cut from the U.S.? On my imaginary list which I will never do, there are probably 10 - 20 cities between San Diego and Phoenix. I'd put Durango, CO on that list ahead of Phoenix. It also thrills me to no end that they missed the Asheville ballot stuffers (see Charlie P's annual web poll). I thought of you guys when I saw Phoenix on the list. I was hoping you'd be offended that I lumped it in with Houston and Nashville. Obviously I need to try harder. I was pretty surprised to see Philadelphia so low on the list. The only place outside of the west coast with Russian River, a couple breweries, a ton of regional breweries and a score of fantastic beer bars. I'm sure there are other, better cities, but 17/20 seemed very low, to me. I would imagine San Francisco has to be on there. Austin most definitely outranks Houston--but H-town's not so bad, what with St. Arnold's and all.